Gone Home released last year on PC, Mac, and Linux as a well-acclaimed narrative game. While speaking at Unity conference Unite 2014, Nintendo of America's Damon Baker spoke on publishing games on Nintendo's Wii U eShop. Baker talked about multiple titles coming to Wii U and confirmed that Fullbright's Gone Home will launch on the Wii U "in the near future." Gone Home launched on PC last year. The first-person exploration game takes place inside a house the main character comes home to after being away in Europe. The house is mysteriously empty, and you wonder through the house finding notes left behind by your family and learn about what your younger sister has been up to while you've been away. Back in March, Fullbright announced Gone Home would make its way onto consoles through a partnership with publisher Midnight City. Since then, Fullbright hasn't said which consoles Gone Home would release on or when it would come out. Baker also made mention of The Swapper as a title that would be out on the Wii U eShop soon. Other games included in the presentation are Cubemen 2 (September 4), Paper Monsters Recut, Nihilumbra, The Fall (available now), and Teslagrad. "We're really excited about the level of Unity support that we're receiving on the platformer," Baker said in his presentation. His confirmation for Gone Home on Wii U takes place around the 6:50 mark. 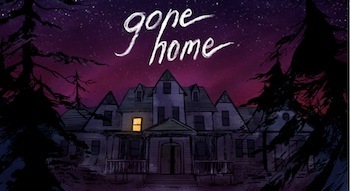 For now, Gone Home is only confirmed for Wii U, but it may release on other consoles as well.